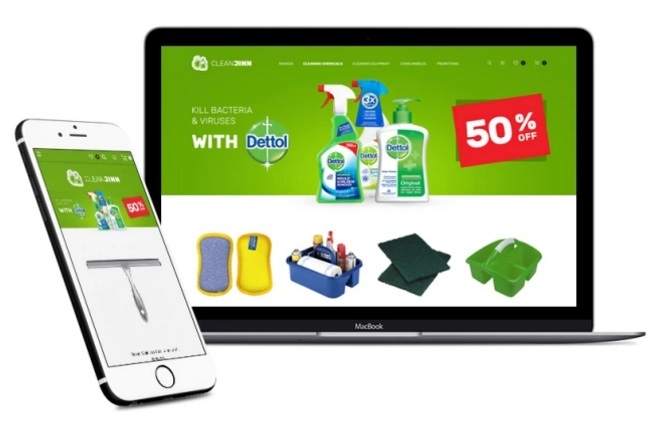 In the following post, you will find our review of the CleanJinn – a Magento 2 theme designed to create an ecommerce store for selling cleaning supplies and tools. 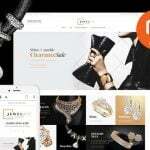 The template contains all the latest features that help to provide top-notch shopping experience. Besides, we write about additional modules that can be installed to improve CleanJinn even more. Social media integration helps to login with the help of social networks as well as share your products. One of the core benefits of the TemplateMonster CleanJinn Cleaning Supplies Magento 2 theme is the availability of pre-installed extensions. 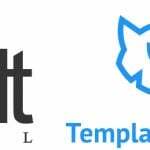 There are more that 10 modules included into the template for free. You only have to install the theme and get all these tools. The most Important modules are described below. First of all, it is the Newsletter Popup extension that allows to collect subscribers in the most effective manner. The popup window is displayed when a visitor comes to your cleanind supplies store for the first time. Inform him or here that by subscribing to your newsletter the visitor will get the latest information about your store and special offers. This will increase chances he or she will subscribe. 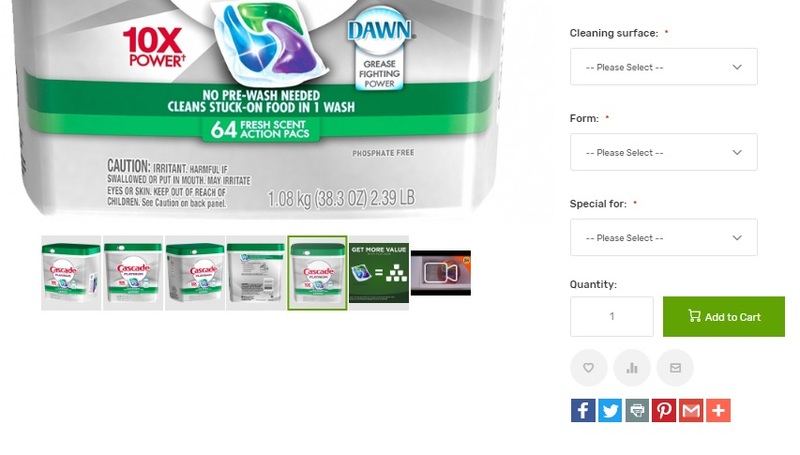 Mega Menu is another prominent Magento 2 module that is included into the TemplateMonster CleanJinn Cleaning Supplies Magento 2 template by default. It can be used to improve the default navigation and revamp the main menu. In the Homepage section of this post, we illustrate the difference between the default menu item and an item created with the help of Mega Menu. A more powerful solution is represented by this module: Magestore Mega Menu Magento 2 Extension. The third vital extension that this template provides is AJAX Search. It works without reloads, supports autocomplete functionality, and displays categories and products. The improved tool helps to find products faster and in a less obtrusive manner. 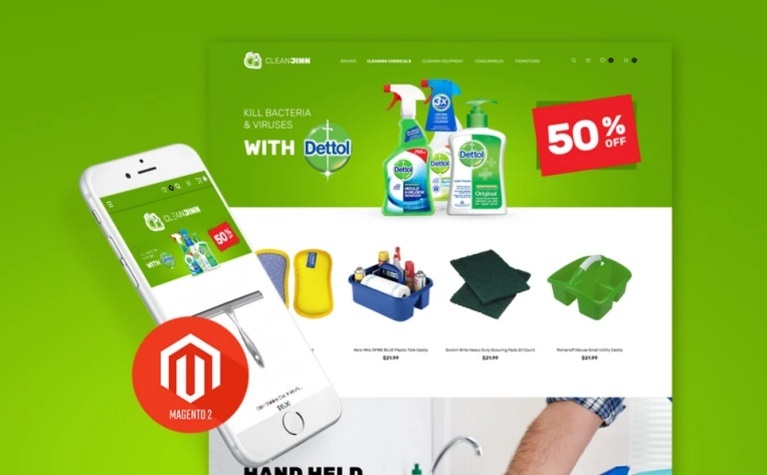 Ant it is necessary to mention that the TemplateMonster CleanJinn Cleaning Supplies Magento 2 template is fully responsive, so customer with all screen sizes get the same well shopping experience. Visitors are never restricted in terms of their device, so all the theme’s features can be leveraged on any gadget. Rich sorting options also help customers to find the desired goods easier. Furthermore, they help to decrease the amount of products per page that is also helpful in case of a mobile shopping experience. The product slider (in case of the demo it is just a static block) is designed to promote any products. You can add image that contains items you’d like to draw the attention of customers to, write product name, and inform visitors about a provided discount. Next, there is a selection of products. 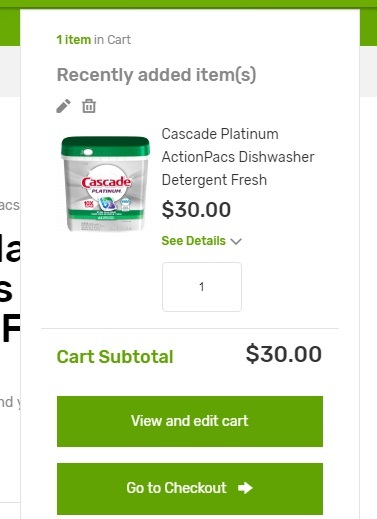 Hover over a product to see the “Add to Cart” button. Static blocks with buttons and links that promote categories, sales, or anything else are available below. The newsletter subscription section is also displayed on the homepage in addition to the popup. Note that the main menu works as a sticky element. Besides, there is always the “Up to Top” button below on the right. 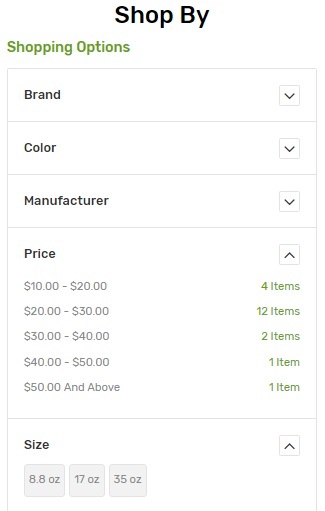 The default category page of the TemplateMonster CleanJinn Cleaning Supplies Magento 2 theme allows to sort products by name, price, or position, display 9, 15, or 30 items per page, and switch between grid and list layouts. As for filters, the template displays the amount of items in front of each filter parameter. Note that it is impossible to apply several filter parameters simultaneously. Check the following link to find out how improve this drawback: Magento 2 Layered Navigation Comparison. On a product page, you can view in stock availability, product name, SKU, short description, price, and brand. Product gallery is also available here. Besides, there may be configurable options and various buttons: add to cart/wish list/compare, send to friend, and share on social networks. The mini cart widget provides the ability to edit or delete items without moving to the shopping cart page. Besides, you can view subtotal and proceed right to the checkout page. Apply Discount Code – you can get a discount here. The best shopping cart Magento 2 extensions are described here: Magento 2 AJAX Cart Extensions Comparison. The checkout procedure consists of two steps: Shipping and Review & Payments. This is a quite standard checkout process in Magento 2, but you can replace it with one step checkout. Choose one of the following extensions: Magento 2 one step checkout extensions.